Since 2004, Spirit League has been the place where children and young adults with special needs can play team sports, make friends, and have fun. As a volunteer, you are the face of Spirit League. The athletes and parents will look to you to make the Spirit League experience the best it can be. There are two ways to volunteer with Spirit League. You can volunteer as a: 1) Team Mentor, or 2) Coach (select “Coach a Team on homepage for coaching information). Spirit League is unique in that we partner with local college and high school students, corporate sponsors and other individuals who have a heart for helping children build confidence through team sports. 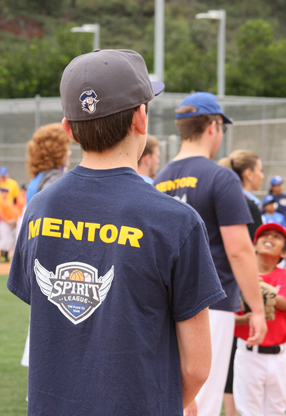 The Spirit League Team Mentor Program trains volunteers to be a consistent presence throughout a season to build relationships with athletes on a specific team. 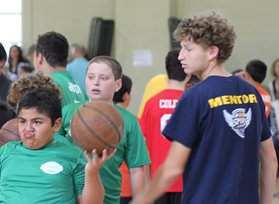 Team Mentors become more involved with the athletes on their team; getting to know their names and building mentor relationships to foster the fun environment created by the Spirit League experience. Spirit League currently offers three age divisions, each with different game times and our seasons are 10 weeks long. For Team Mentors, we ask that you select a time that you will be available to volunteer for the entire season (see specific sport page for anticipated game times). We would like you to be part of the same team for the entire season so you get a chance to know your team members and be able to understand your coaches needs. If you are a high school student receiving volunteer credit hours for school, please be sure to arrange tracking of your hours with Spirit League staff at the start of the season. Certificates verifying hours will be provided at the end of the season, upon request. You will need to check in with staff each weekend to track attendance. Attend at least 8 games within the respective 10-game season. Create an online account by clicking “Apply Now” then complete your application. Once your application is approved, Spirit League staff will contact you with directions to complete the Online Team Mentor Training Program. For Team Mentors 18 years and older, complete a criminal history background check per the Spirit League Background Check Policy. You will be contacted by Spirit League staff within three working days after receiving your application with additional direction to complete the Online Training Program (15 years and up) and conduct the criminal history background check (18 years and up). 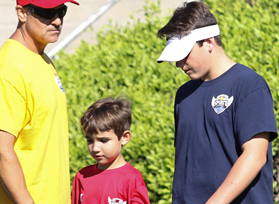 As a Coach, athletes and parents look to you to make the Spirit League experience the best it can be. Not only does the Spirit League coaching experience impact the lives of our amazing athletes, it impacts the lives of our coaches as well.